The Directing Change Program & Film Contest is part of Each Mind Matters: California’s Mental Health Movement. The program offers young people the exciting opportunity to participate in the movement by creating 60-second films about suicide prevention and mental health that are used to support awareness, education and advocacy efforts on these topics. Learning objectives surrounding mental health and suicide prevention are integrated into the submission categories of the film contest, giving young people the opportunity to critically explore these topics. Program participants – whether they are making a film, acting as an adult advisor, or judging the films – are exposed to appropriate messaging about these topics, warning signs, how to appropriately respond to someone in distress, where to seek help, as well as how to stand up for others who are experiencing a mental health challenge. In addition, schools and organizations are offered free prevention programs and educational resources. Last year, the Directing Change Program and Film Contest received 742 film submissions from 2,430 young people, representing 164 schools and organizations, across 32 counties statewide. Over the last five years the Directing Change program received 2,138 films from 5,288 youth participants representing 328 high schools, 30 youth and community based organizations and 20 colleges. To learn more or if you are interested in an interview, please contact us. In 2017, NORC at the University of Chicago conducted a comprehensive evaluation with 131 youth participants. Findings from the study found Directing Change to be highly effective in increasing knowledge, behavior and attitudinal outcomes related to suicide prevention and mental health and demonstrated changes in school climate. Directing Change participants were found to be more willing to engage in conversations aimed at suicide prevention and have fewer attitudes that contribute to stigma about mental illness. Furthermore, participants more frequently agreed that suicide is preventable, identified more warning signs and were more willing to encourage others to seek help, beyond their own social circles. View the report here. 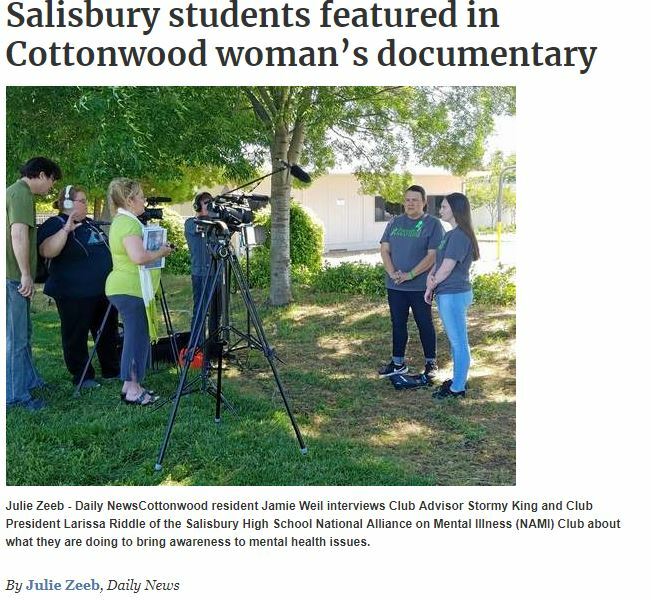 Red Bluff Daily News covered Salisbury High School students in Shasta County’s inclusion in filmmaker Jaime Weil’s documentary series. Each Mind Matters announced 2018 Statewide Winners along with celebrity filmmakers and actors who received awards for their mental health advocacy work. The San Bernardino Sun recognized Apple Valley High School student’s third place regional winning film “Speak Up”. Chico-Enterprise-Record recognized Pleasant Valley High School and Butte College student winners for their films “Silence” and “I Am Not Ashamed”, which won second place statewide. The Orange County Register mentioned first place winner Creston Brown for his film “First Steps” as well as winners Hallie Conrad and Megan Beehler whose films won in the Suicide Prevention and Through the Lens of Culture categories. Directing Change Program Manager and Suicide Prevention Specialist Stan Collins discussed the release of season two of the Netflix show “13 Reasons Why” on KSRO Radio in Santa Rosa. Listen here. Apple Valley students spoke with Daily Press about their third place statewide winning film “Speak Up”. Regional Directing Change fi­lms are promoted with the local media and in 2017 a total of 15 stories about Directing Change were covered. 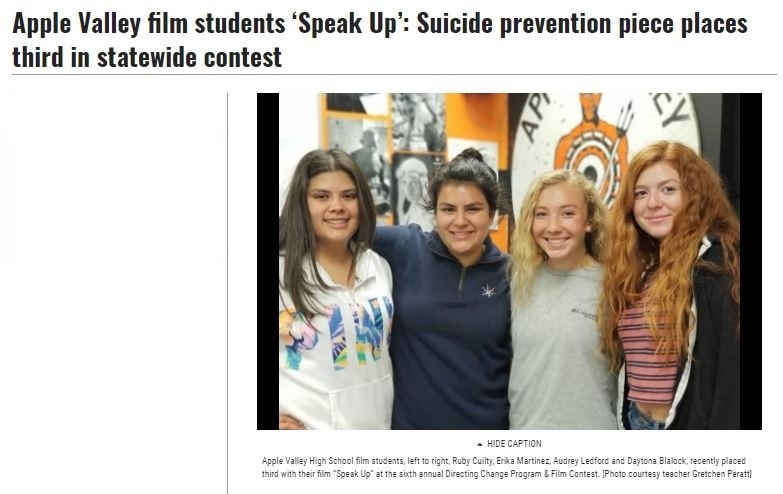 The East Valley Times in Shasta County highlighted Shasta High School students Zach Osterday, Owen Castagnoli and Eddie DeAvila, who received an “honorable mention” in the suicide prevention category for their film “The Missing Pieces”. Del Mar Times highlighted Torrey Pines High School’s Yellow Ribbon Week March 13-17th, which included presentations and activities to educate students about the importance of taking care of their mental health. Coordinated by advisor Don Collins, Torrey Pines students’ Directing Change films were screened and discussed. Torrey Pines High School students were also recognized on San Diego Channel 10 news for their 1st place regional winning film “Light at the End of the Tunnel”. Cristian Aragon, Jose Becerra, Nick Meraz and Jay Butler discussed the importance of making films to change the conversation about suicide prevention and mental health at their school. Watch the story here. San Diego Union-Tribune, Clovis Independent, California Healthline, Davis Enterprise, Orange County Register, Today.com, DKS Media Solutions’ website, Noelle Cope’s blog, Radar Online, Victorville Daily Press, Elk Grove Citizen, Redwoodvoice.com, Victor Valley News, The Laguna Beach Indy, ChicoER, CoyoteChronicle.net, plus an additional 208 online publications picked up Directing Change stories through PR Newswire. KPBS Evening Edition and KPBS.org news highlighted the NAMI San Diego Directing Change film Screening on September 13, 2016. Today.com featured Murrieta Valley High School student Ben Finnie recognized for his film “Leap of Faith’ Directing Change program and youth. The film makes a plea for those in need of help to take that step and reach out to someone. Read the article here. “Over the past four years we have received countless stories from youth and teachers who have shared how the program has opened up conversations in the classroom, at home and among friends,” Jana Sczersputowski, founder and project director for Directing Change Program & Film Contest, told TODAY. The CW6 San Diego interviewed Directing Change President Jana Sczersputowski and shared films submitted to the contest by local San Diego youth. The Elk Grove Citizen highlighted student Ryan Santiago from Franklin High School for his first place regional winning film, “The Guides of Life” which also won a first place statewide prize in the Suicide Prevention category. Ryan’s animated film is about one friend experiencing thoughts of suicide and how his two close friends try to help him through it. It encourages people to reach out to someone during those times; to not be afraid to reach out for help. UC Davis student Marielle Pastor won a second-place award for her film “This is Claire”, which creatively explores how college students can help fight stigma around mental health challenges. View the article here. The Madera Tribune highlighted Madera South High School, Pioneer Technical Center and Minarets Charter High School students’ whose films received a second place prize and an honorable mention. PR Newswire shared the outcome of the 2016 statewide award ceremony which recognized first-generation college students, Amanda Deda and Alejandra Vaca who envisioned the creation of a short film that would express some of the barriers they faced when accessing mental health services. The first place film “The Language of Healing” was submitted in the Through the Lens of Culture Mental Health Category. 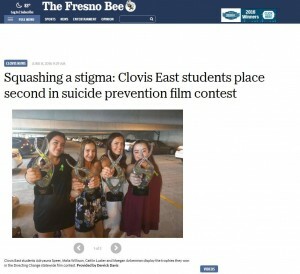 The Fresno Bee recognized Clovis East students who won the second place prize in the Through the Lens of Culture category at the 2015 Directing Change Award ceremony for their film “Depression has No Culture”. 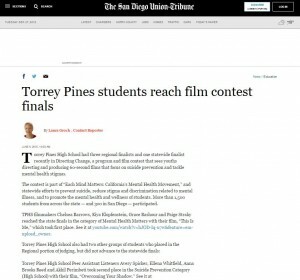 Torrey Pines High School students were featured in the San Diego Union Tribune for their first place regional winning film “This is Me”. View the San Diego Union Tribune article and a link to their winning film here. Siskiyou Daily News highlighted students at Jefferson High School who met with clients of Yreka’s Six Stones Wellness Center recently to conduct interviews in the creation of their video addressing the stigma surrounding mental illness. Students from Canyon High School, Katella High School, and San Juan Hills High School were recognized by the Orange County Register for their films advancing to the statewide round of judging. The Claremont Courier recognized Claremont High School student filmmakers from the advanced video production program that received a first place prize in the mental health matters category and a third place prize in the suicide prevention category. During Mental Health Matters Month, Humboldt County highlighted local student winners in the Eureka Times-Standards and their own red carpet award event. Livermore Independent covered the four Pleasanton Foothill High School students who created the first place winning film titled “Years Unfold.” The first place winning film in the Suicide Prevention category in an annual contest sponsored by Each Mind Matters discussed the ways that high school students can intervene with their peers to help prevent suicide is a finalist for a state award. The Record Gazette highlighted four members at the Boys and Girls Club of the San Gorgonio Pass who wrote and directed the video, “Speak Out.” The film depicts a straight-A basketball player who has started to lash out socially and withdraw from activities, and how his friends talk to an adult who connects the youth with help. Fox40.com covered Whitney High School’s broadcast program students who won more than a dozen awards locally, regionally, and nationally including first and third place awards for their Directing Change films. This is the most number of awards they have won in one school year.